Explore an amazing local historic area in this fun, high-energy treasure hunt team building activity. 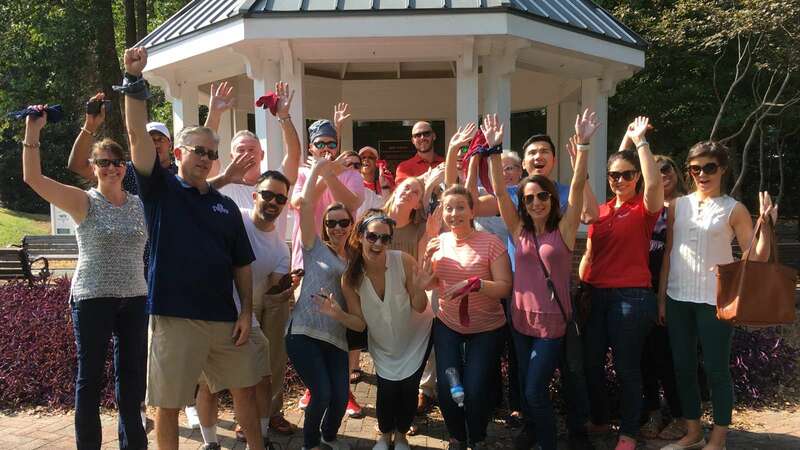 A good old fashioned team building treasure hunt throughout a historic downtown area where teams outsmart their competition in this fun event. They will unravel clues, find hidden challenges, solve brainteasers and trivia, take pictures of their team doing outrageous things, and compete in mini challenges. Delve into historical happenings, identify famous people from the area and learn amazing new facts while having a great time. Welcome & Warm-Ups (5-10 minutes) Our staff welcome the participants to the neighborhood and get everyone ready for a great scavenger hunt. We then lead some fun warm-up activities that also randomly create small teams. Event intro (5 minutes) Our fun and energetic staff give the group a quick orientation to the event and hand out team supplies.. Bygone Brainteasers: Teams work on this collection of mental challenges with an olden time flair. Town Trivia: Teams search throughout the area to find answers to trivia questions about the local area and Georgia history. Historical Landmarks: Teams receive a page full of pictures that are close-ups of various landmarks in the hunt zone. They receive points for the ones they find and correctly identify. Vintage Vignettes: Whenever a team finds an Atlanta Challenge facilitator, they have the opportunity to do a fun bonus video mission. Rendezvous Challenges: These fast paced challenges take place at a secret location that the teams must find. Scoring (10 minutes) Teams reconvene at the starting area, turn in their scavenger hunt materials and finalize scores. Have fun together and build morale. Explore an interesting part of the community. "Thank you for such a wonderful team building event, the feedback was very positive. We will definitely contact you for our next time."